Many thanks to all who tuned in to support us during our climb of Mt. Fuji. It all went extremely well on the mountain, and we’ve received a lot of positive feedback through the networks since returning to Tokyo. Curated photos and videos will be posted to Tamegoeswild.com in due course. Over the next 24 hours, a group of 10 intrepid explorers led by @tamegoeswild will be making their way up the slopes of Mt. Fuji. At 3,776m the rim of this dormant volcano crater is the highest point in Japan. Join them as they push the temporary NTT mobile data network to the limit with live streaming video, Twitter messages and GPS updates. With them they have the Rinkya iPad of Stamina – this will be displaying all tweets containing @tamegoeswild – so send in your message now and offer them encouragement them as they battle up (and then down) the volcanic slopes. Have a request for a song, dance, Haiku recitation or purchase from one of the vending machined at the top? Send them in – all welcome! Pocket Wifi and network access kindly provided by NTT DoCoMo. Direct-to-the-net Cerevo Cam kindly provided by the makers. Thank you to @stevenagata for additional tech support. In a departure from the MobileinJapan.com norm, contributor Joseph Tame encourages readers to join him as he leads a group up the slopes of Mt. 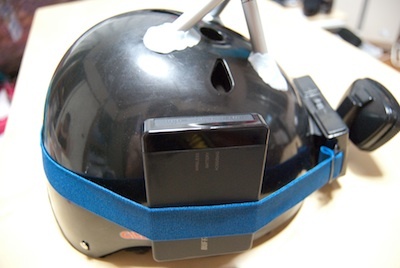 Fuji – whilst live streaming the whole adventure over a special temporary data network. You won’t usually find mobile network coverage on Mt. Fuji, mainly because the local inhabitants (volcanic rocks) don’t have much use for phones. However, every July, NTT DoCoMo switch on two stations at the foot of the mountain, beaming coverage up its slopes. Receiving these signals are two repeaters placed on the rim of the crater, providing coverage around the two shrines up there. 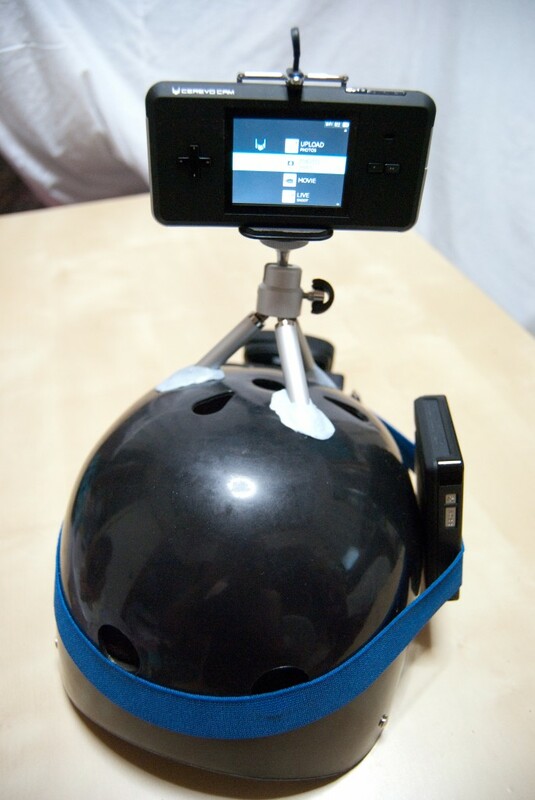 The Cerevo Cam Live has been cunningly mounted in a 1,800 yen plastic kid’s helmet bought in Donki Hote. It is held in place by generous dollops of the UK’s finest Blu-Tak. We’ll be providing a GPS signal too so you can keep tabs on just how slowly we’re moving. You can actively take part in this spectacle by sending your messages via twitter – just reply to @tamegoeswild and it will be displayed for the whole team to see on the iPad of Stamina. 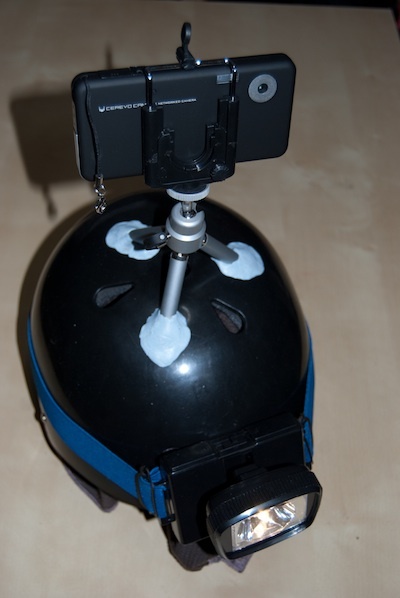 We’ll be watching our timeline and will try to be as interactive as possible during the climb. 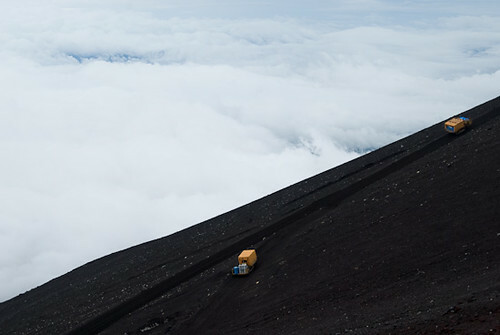 Also, we’ll post updates on the latest progress to @tamegoeswild in the lead up to the climb, and in the event that the video stream goes down. Japan DoCoMo To Abandon SIM Lock By 2011. Really? There’s been a surge of articles today about NTT DoCoMo, Japan’s largest operator, apparently announcing it would go SIM lock free by next year. Heck, even its shares were up almost 1.7% at the Nikkei 225 -actually outpacing it. We’ll see. The plan is still “under consideration“, it’s unclear if all handsets will be included and what would be the exact conditions. One thing is for sure though, DoCoMo wants in on the iPhone action. That’s what it’s all about. Let me jog your memory. Last April, under the freshly-elected DPJ Government, Japan’s Ministry of Internal Affairs and Communications sparked a debate with its intent of rendering the whole mobile industry SIM lock free. Following that month’s meeting with the big three, the government set a deadline for the public to give it feedback. That was June 23 -and, yes, it’s Japan, you could send your opinion by fax. It’s all over now. The guidelines for 2011 are about to be finalized. The schedule is not lost on DoCoMo. But we’re talking about guidelines. Yup, guidelines, not regulation. If you fancy reading the preliminary ones in Japanese, here’s the official document [PDF], but basically, they’re saying one thing: “we’d love it if you could unlock your SIMs, but just love it, right?, we’re not forcing you in any way”. Hey, did you really think that government would take a stand with KDDI raising its network compatibility issues, Softbank pestering against it -projecting a doomsday with soaring costs in handsets-, DoCoMo being more lenient about customer’s choice and an onslaught of faxes? Anyway, here are my thoughts: DoCoMo is probably the operator that has the least to lose in such a move. It has the better network, the largest -and very loyal- customer base (around 56m) and it doesn’t have the iPhone -nor the iPad. Yes, I know, some of you hate that thing, but it is shaking the mobile market in Japan: Softbank knows it and is adamant not to let this SIM lock free craze go without a fight. I urge you to read SoftBankSucks’ coverage of the SIM-lock debate for more: part 1, part 2, part 3 & part 4. In the end, you have it all. Guidelines, a saturated market, a shaken industry and the battle for the smartphones. Toshiba and Fujitsu Shaking Japan’s Mobile Industry. Or Not. Have I just felt an earthquake? Fujitsu Limited and Toshiba Corporation announced that today they have signed a memorandum of understanding (MOU) to merge their mobile phone businesses. Toshiba and Fujistu? If you’re an international readers, you’ve probably never touched a handset from either. In Japan, you might just have. As per tradition, those phones are rebranded via the operators. Toshiba provides handsets for KDDI Corporation mainly, some to NTT DoCoMo and a few to Softbank Mobile. Fujistu only deals with the first second. Yet, it’s Fujitsu who will hold most of the shares (estimates ranging from 70 to 80 percent) of that new entity which could bear its name. Why? Well, it’s produces a lot of so-called dumb phones, which I would qualify as gimmicky phones, since they boast such amazing features as waterproof capability, perfume holder and metallic yellow color. A lot of dumb phones, but no real smart phones. Toshiba, on the other hand, has released the internationally recognized T-01A. You know a very thin unusable phone based with a custom-built UI to hide Windows Mobile 6.1. What a blast it was. It even got a successor, the TG02, a decent effort with less emphasis on hiding WinMo 6.5. Another hit. Not. Anyway, join the two companies and you’ve got a juggernaut holding less than 1% of worldwide market share. Which means they’re basically selling only in Japan. With some success, to be fair. All those scented waterproof pink phones do sell. The company will actually become the 2nd biggest handset seller with 18.7% of the market, right behind Sharp (that other company you have seen phones from, right?) which holds 26.1%. The two companies are merging in order to strengthen their smartphone handset development -saturation not being a strong enough word when it comes to the dumb phone segment, 25% mobile phone shipment plunge last year cannot be understated. That’s a good idea. A better one would be to forgo Windows Mobile for a while -at least until Windows Phone 7- and get in the Android boat. That’s just my two cents, but when you witness 50,000 pre-orders for the Sony Ericsson (I’m certain you have heard about that company this time) Android-based Xperias, that shows you the Japanese market, for all Galapagos it can be, is ready for some action. Some action dutifully provided by the elephant in the room, Apple’s iPhone. It might hold a tiny share of the market (let’s say 3% for the sake of debate) with almost 3m handset sold, but has clearly set a new pace in a country which for some time was used to dictate all the mobile rules. Need one more official reason behind the joint-venture, besides the unspoken-of Casio, Hitachi and NEC mobile merger? Overseas expansion plans. Well, the phones are already mostly made in China. Oh, they’re talking about actually selling their handsets abroad. Ok then. Good luck. Have you felt an earthquake? I didn’t. ERRATUM: Thanks to community member Dan for spotting the factual mistake I did out of hastiness: Fujitsu only manufactures handsets for NTT DoCoMo and not KDDI.